“The Phantom at the Mill”, published in 2008, is a comprehensive novel dwelling on Romanian communism; it scooped the Romanian Writers’ Union’s Prize for Fiction, while her 2009 best-seller “Lizoanca, when She Was Eleven” received the Romanian Academy’s “Ion Creanga“ Award. “Lizoanca…” was translated by the Horlemann Verlag Publishers in Berlin. The latter boasts the publication into German of Mo Yan’s works. We recall that Mo Yan is the foremost contemporary Chinese writer, who was awarded the Nobel Prize for Literature in 2012. Between March 14th and the 17th 2013, Doina Rusti was invited to the Leipzig International Book Fair, where she gave a series of readings and had a number of meetings with her readers. Concurrently, Doina Rusti took part in other events, such as a literary dialogue, the Deutsch Rumaenisches Forum organized in Berlin jointly with the Romanian Embassy. Apart from Doina Rusti, taking part in the Leipzig Book Fair were other Romanian writers such as Gabriela Adamesteanu, Daniel Banulescu or Radu Vancu. The novel’ Lizoanca” will soon be brought out by the Rediviva Publshers in Milan, Italy, and by the Ediciones Traspies, in Granada, Spain. With details on the novel “Lizoanca” here is the author herself. Born on February 18, 1959 in Comosteni, a village in southern Romania, Doina Rusti made he debut in 1997. Among her books, worth mentioning are “The Red Little Man”, a novel about the power of loneliness in today’s world and “Zogru”, a fantastic story about a character crossing various historical ages, like a spirit embodying human experiences and aspirations. Also, Doina Rusti has been publishing short fiction, some of her short stories being included in contemporary fiction anthologies and collections. 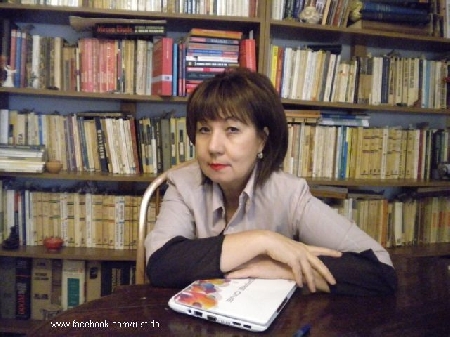 A specialist in symbology (she is a professor), Doina Rusti has also written a series of non-fiction books, among which “Dimitrie Cantemir’s Bestiary”, “Cultural Print Media”, “The Encyclopedia of Humanistic Culture”, “A Dictionary of Symbols of Mircea Eliade’s Works”. Young literary critic Paul Cernat wrote that Doina Rusti is, QUOTE, a strong and original prose writer, a rara avis in Romanian Literature after December 1989., UNQUOTE, while writer Nicolaa Breban praises Doina Rusti as a, QUOTE, first –class fiction writer in present-day Romanian literature. UNQUOTE.